Second largest football project in Slovakia joins our database thanks to the help of Spartak Trnava. 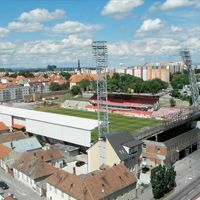 After demolition of national Tehelne Pole we can now show you how old stands gave way in Trnava, soon to be replaced by City Arena. In March 2013 demolition works began at the heart of Slovakian Trnava. One stand after another, three sections of the ground gave way, leaving only the west side untouched and allowing Spartak to host their games here during construction. On Sept 20 groundbreaking ceremony took place with the corner stone being installed on site. Within 15 months three new stands are to be built, each with two tiers of covered seating. The project was possible thanks to private funding by Euro MAX Slovakia, shopping centre developers. In return for funding the €15-16m stadium investors will have a retail complex adjoining the ground, together with over 1,000-capacity parking structures. The stadium is to be ready by the end of 2014. Thanks to the help of Spartak Trnava football club we'll be able to show you the progress from today on!